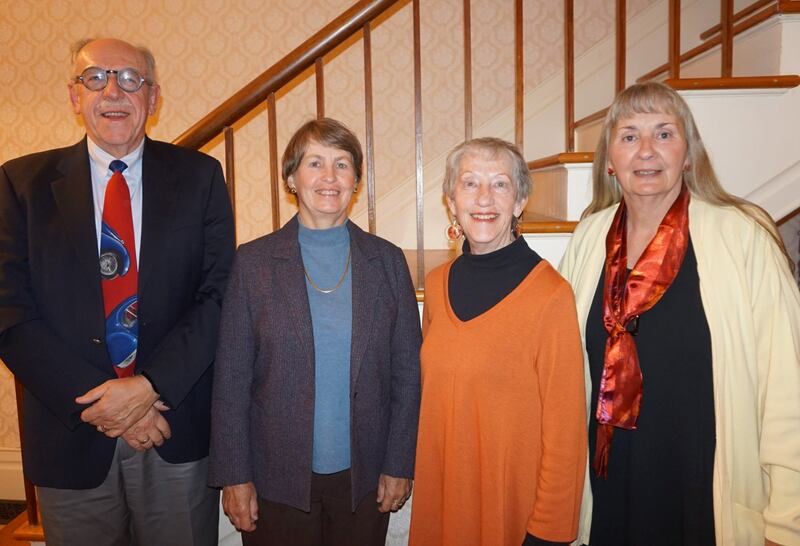 A new slate of officers for the Endless Mountains Heritage Region includes (above, from left) Tom Henson, secretary; Sarah Carr, vice president; Alice Deutsch, president; and Melanie Norton, treasurer were confirmed at EMHR’s annual dinner and reorganization meeting in Wyalusing, which began under the pavilion of Grovedale Winery with a welcome from EMHR executive director Annette Schultz (top). 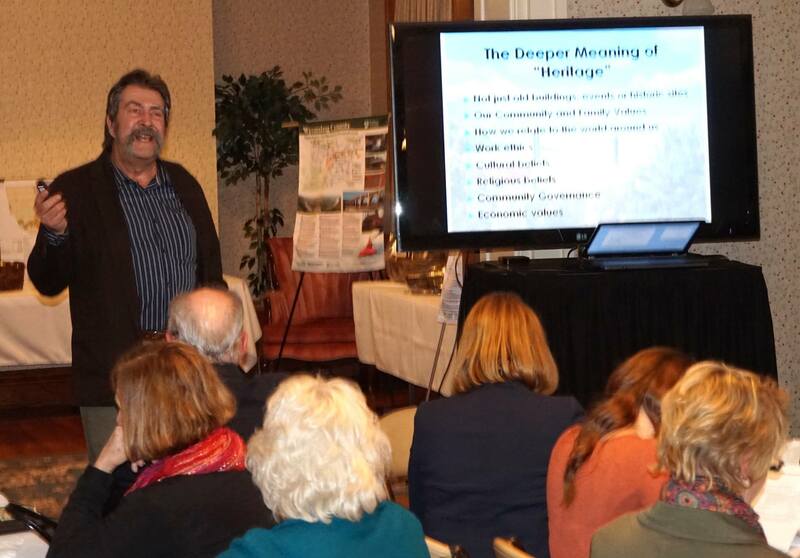 The annual meeting of the Endless Mountains Heritage Region (EMHR) was held on Oct. 15 at Grovedale Winery and P. Dean Homer Funeral Home in Wyalusing. Board members from Bradford, Sullivan, Susquehanna, and Wyoming Counties welcomed three new associates to its 20-member board and confirmed new officers. EMHR executive director Annette Schultz provided welcoming remarks in the pavilion of the winery as the setting sun cast a glow on the surrounding vineyards. Schultz announced a slate of potential new members that included Karen Black of Sullivan County, Alice Deutsch of Susquehanna County, and Joyce Kerrick of Bradford County. Deutsch had served on the board and served as president prior to 2011. She accepted the nomination by the director to come back into the organization as the new president, replacing Sandra Wilmot of Susquehanna County who had served her full term. Other nominations included Sarah Carr of Wyoming County as vice president, Melanie Norton of Sullivan County as Treasurer, and Tom Henson of Bradford County as Secretary. All of the nominations were confirmed when the meeting convened after dinner. Among topics discussed were contributions by each county to EMHR and the Buy Fresh Buy Local program. With A Taste of the Endless Mountains slated in Troy that coming Saturday, there was renewed discussion that such events can also be conducted in the other three counties to help promote and sustain the Buy Fresh program. 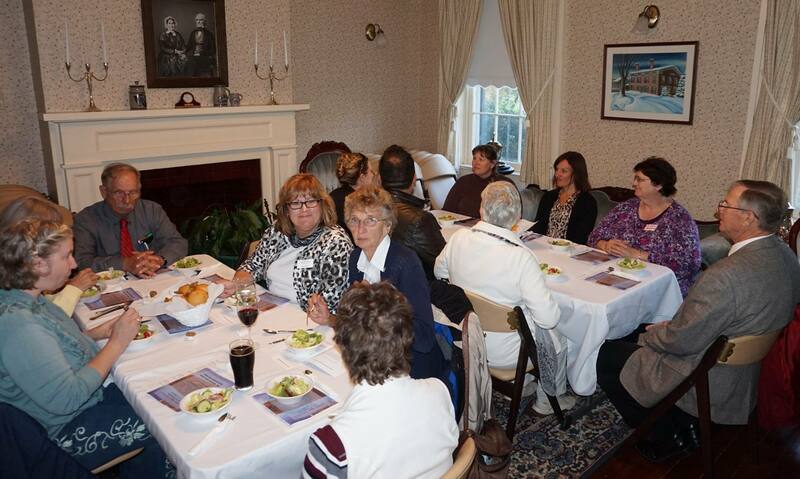 A social hour was observed after Wilmot conducted her last EMHR business meeting, and members mingled with winery guests and visited the Wyalusing Valley Museum prior to gathering in the funeral home for a catered meal and several presentations. Schultz presented a basket of Grovedale wines to a tearful Wilmot, who was also resigning from the board. Schultz thanked her for shouldering responsibilities that went well beyond what she had anticipated when she was elected the previous year. 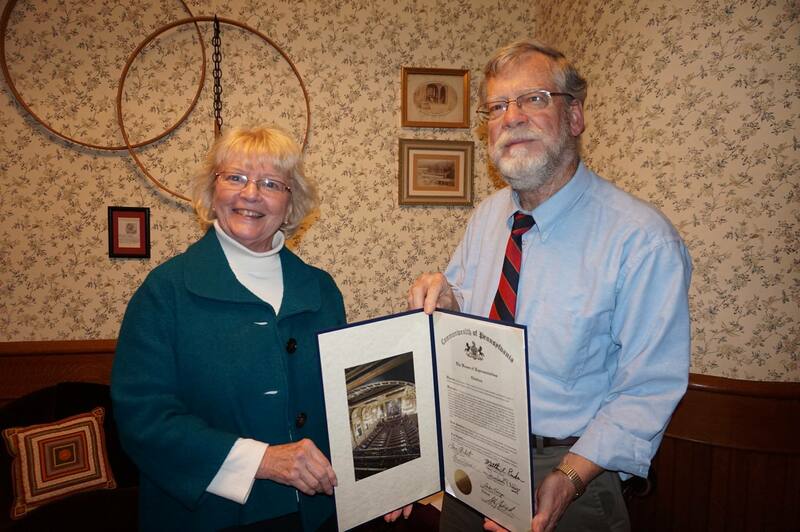 Rep. Tina Pickett was on hand to present to EMHR director emeritis Bob Veleker a declaration from the PA House of Representatives acknowledging his tireless dedication to EMHR during a year that brought the organization change and a new director. Banquet host Jeff Homer gave a brief presentation about the history of the Welles/Homer property and the evolution of the businesses that have been conducted there. Bradford County board member and vice-chairperson of the Endless Mountains Resource Conservation and Development Council Mike Lovegreen followed with a condensed version of a project coordinated by the Bradford County Conservation District and like-minded partner agencies to determine the vitality and viability of agriculture in Bradford County. Lovegreen was excited about the diversity and energy brought to the table by participants in a series of conferences and committed meetings conducted to help construct a current and fluid model of the agricultural landscape in Bradford County. Although the focus of the study was Bradford County, Lovegreen included recently collected data that showed similar trends for the other three EMHR member counties. He presented to those in attendance an outline of a 90-page report funded in part by EMHR. Concerns that the emergence of the natural gas industry in the Endless Mountains would lead to the retirement of many farms did not pan out, he related. Agriculture is healthy and growing in the region, said Lovegreen. But it is changing. Statistics indicate that the acreage devoted to agriculture in Bradford County has increased since 2008, when gas exploration began in earnest. There are less dairy cattle but more beef cattle and more cattle overall. There has also been growth in vineyards and wine production, and niche operations such as alpaca and llama farms. Maple products continue to enjoy solid growth. Agricultural revenue in the four-county Endless Mountains Region exceeds that of the entire state of New Hampshire, Lovegreen noted. What would be most beneficial to ag producers in the region, he suggested, is an “ag czar” at the state level to coordinate programs geared toward agricultural redevelopment and farm preservation. The Agricultural Viability Study & Program has been recently finalized and will be posted at the EMHR website in November. The EMHR board will meet again on Wednesday, Dec. 16 the Braintrim Baptist Church in Laceyville. After a meeting, board members will tour Laceyville’s Oldest House. To learn more about the Endless Mountains Heritage Region, its mission, grant programs, and opportunities for involvement, interested readers may visit www.endlessmountainsheritage.org. 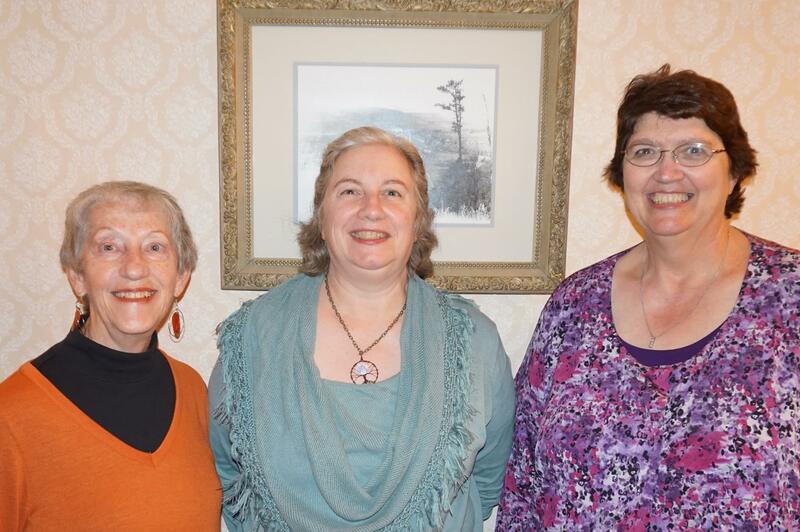 New EMHR board members approved at the annual meeting included (from left) Alice Deutsch of Susquehanna County, Karen Black of Sullivan County, and Joyce Kerrick of Bradford County. Mike Lovegreen addresses those in attendance at the annual membership and reorganization banquet of the Endless Mountains Heritage Region at the P. Dean Homer Funeral Home in Wyalusing. Rep. Tina Pickett (left) presents long-time EMHR associate Bob Veleker with a Volunteer of the Year Award for his ongoing dedication to the organization, after board members and other guests enjoyed dinner in the Red House (below).